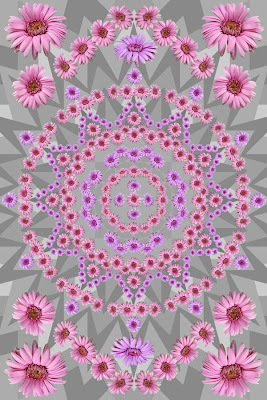 Going back one step, I created a star background and dragged our mandala onto it, but found that it was too light; so I created a new layer from backgorund and went to image>adjustments>hue/saturation. The bottom slider in the dialog box is for lightness. I slid it left -50 to darken the background to what you see in the previous post. I think you will agree that it is much better than this.